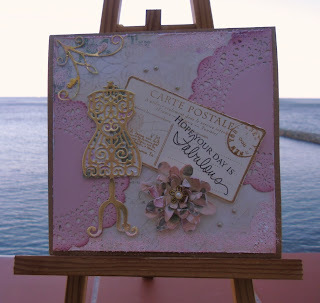 Gorgeous card Sylvie , love the fab design. Gorgeous card Sylvie - no wonder she loved it. The soft colours and design work so well. When Iread your list of ingredients it made me wonder what we would do without our dies now? Things have come so far from when we just had stamps, paper and the odd punch or two! lol Glad your weather is so nice........absolutely pouring with rain here at the moment and really chilly! How feminine and lovely! I love that dress form and the sweet colors! Hi Syvie, I'm not surprised she totally loves it, it's fabulous. Love the colours and layout, sooo elegant.